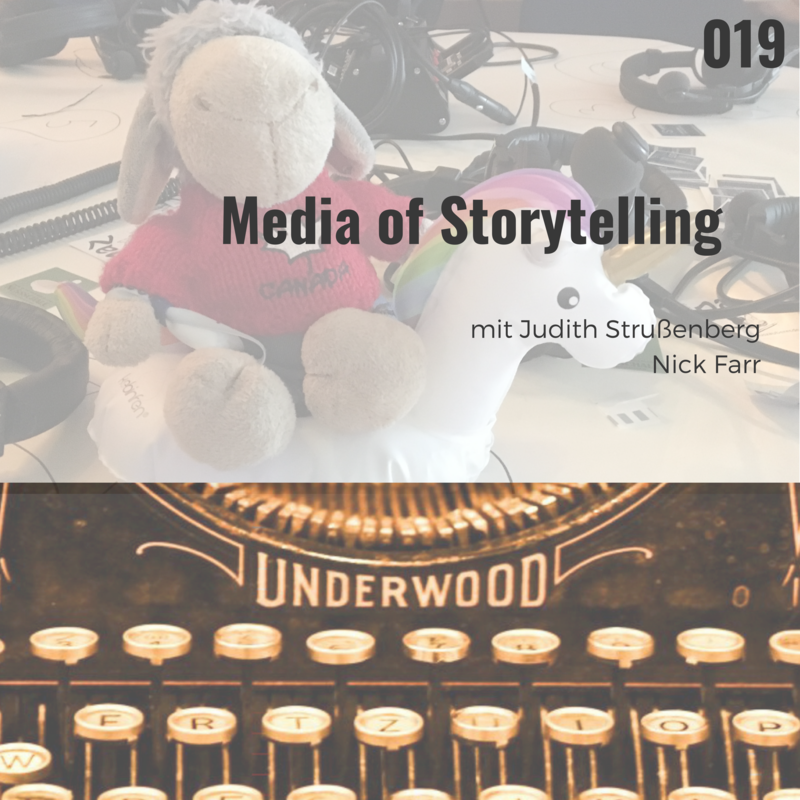 Nick Farr, Judith Strußenberg and Klaudia talk about different media of storytelling – written text, movies, live performance and computer games. A very (!) spontaneous episode but with lots of fun and three different angles on how stories can be told and percieved. Podwichteln 2017 – die Auflösung! Our topic today: Books vs. live performance vs. movies vs. audiobooks – the same story can appear different in the various formats. If you can read the audience you can learn to grab and hold their attention. There are some audiences with a much shorter attention span where you have to punctuate your story much more. Sometimes in movies you see not the story but the actors’ response to the action and you know what’s happening. Almost all stand-up comics have a tendency to depression and self-loathing. 😉 Nick has been part of the global hacker community for at least 20 years. Judith is part of the History of Germany Podcast, Erbstücke Podcast, Schreibweisen Podcast and Puerto Patida. Hitory offers the most compelling stories. Serial storytelling – overall story arcs can also hook a reader in a special way. Computer games let the player construct their own story within the game parameters. Text-based adventure games are still a thing. There are choose-your-own-adventure books where you can get to the same place in four or five ways. Also some interesting project for the writer! There has to be enough space and possibilities for the readers, even some, that the author wouldn’t choose. There are writers who love all the details of the setting and then there are writers who love action. A really good text-based adventure game will put all of this into the game; but the player will only see a tiny fraction of all of this. Shakespeare: There were flags put up at the theatres to indicate, what was being played that day. A white flag meant comedy, a black one tragedy, and red for bloody history. History is everything. It’s about humanity, things that still can tell us something today – same patterns, same needs, same things happening over and over again. Things that happened are not only stories. Things are still the same than a thousands years ago. Also our stories are still the same, only with slightly different characters, but they are still about love, death, friendship, family, trust and betrayal. Mankind doesn’t really change over time. Spoken word and painted pictures were the first, original forms of telling stories. At the root of all stories is always a compelling conflict. Unless you have that really compelling story vision behind it, whatever you have is going to fail, no matter how pretty it is. Even most elaborate poeras were booed because the story was bad. Or it wasn’t told the way, the story was meant to be told. You can tell a compelling story, but if you pick the wrong tools to tell that story, it’s horrible. A good story has to touch us deep inside. A really good story can haunt you for a while. You just don’t read the ending first. Never! Every story is based on words or on pictures. Storytelling is a great way to reveal things about you without beoing too vulnerable. Nick says about himself, he is not himself when at congress, but a character. This is also true for otzher well-known people. You don’t interact with them as people, but with characters. It’s a very different thing to write about death and seeing it all around you. The cultural background of the reader/listener/player/recipient can change the meaning of the whole story. And the story can get quite a different feel to it depending on the medium.